The initiative would mandate hotels with 50 or more rooms to provide panic buttons at no cost to employees, ensure workers can report assaults without retaliation and be reassigned to different floors, require signage about the law in guest rooms, restrict mandatory overtime and limit the square footage workers have to clean. Members of the labor union UNITE HERE Local 11 and the Long Beach Coalition For Good Jobs and Healthy Communities, which filed the paperwork for the initiative in February, were on hand to deliver 12 boxes containing over 46,000 signatures, well over the 27,000 signatures required to qualify the initiative for the general election later this year. Montañez said the signature-gathering process was a group effort of about 23 organizations, including college students, clergy who allowed organizers to gather signatures at their congregations as well as paid canvassers. However, one group is crying foul about the way some were collecting signatures, including alleged false and misleading statements given to potential signers. 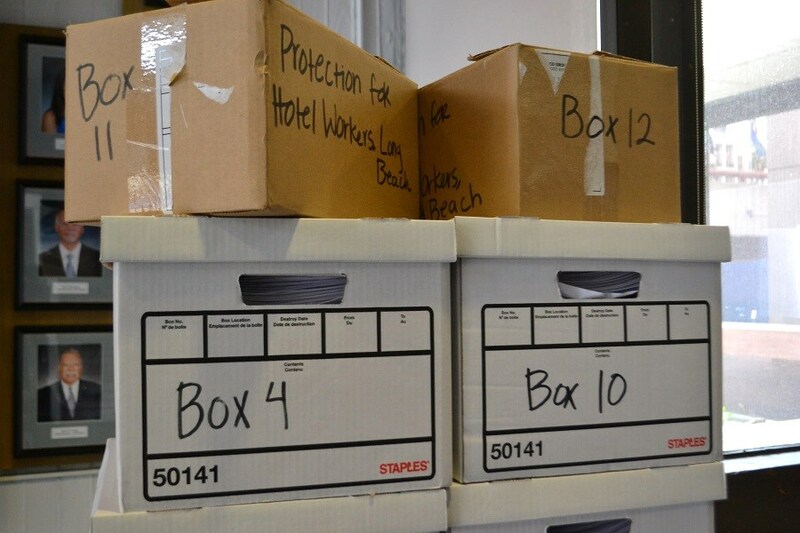 The Long Beach Hospitality Alliance, made up of the city’s largest hotels, on Tuesday called on the city clerk and city prosecutor to investigate what they say is a violation of state law and to invalidate the signatures allegedly collected using misleading tactics. “It had come to our attention during the signature-gathering process that multiple locations had at times a lot of misinformation handed out to potential voters and folks signing the petitions,” said Jeremy Harris, a Hospitality Alliance member and senior vice president of the Long Beach Area Chamber of Commerce. Photo taken by Councilwoman Suzie Price and courtesy of the Long Beach Hospitality Alliance. Only two such incidents have been reported in the last couple of years, according to the Hospitality Alliance, which cited a police memo from last year that stated that from September 1, 2016 to August 31, 2017 two assaults were reported by hotel employees. One incident was sexual battery of a female employee and the other was battery of a male security guard. That memo was provided to city staff last September when the city council considered a law similar to the one being proposed. The Hospitality and Workload Safety Ordinance, previously referred to as Claudia’s Law, was struck down with a 5-4 vote by the council, triggering labor advocates to bring the issue to voters instead. 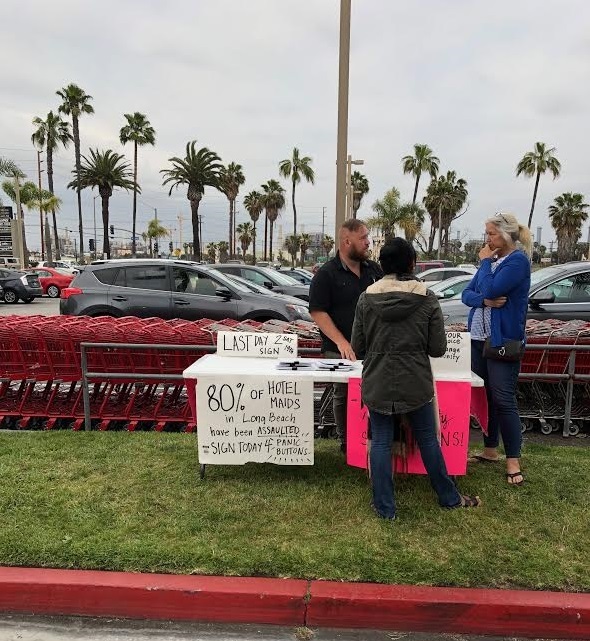 In a statement provided to the Hospitality Alliance obtained by the Post, Price described her encounter with that petitioner in the photo while grocery shopping over the weekend. Price said after telling the paid signature gatherer that his information was inaccurate and that he had a duty to share accurate information, they got into a brief verbal exchange before she ended the conversation and walked away. Victor Sanchez, who is a campaign director for the coalition, said he was not familiar with the incident but called it unfortunate, stating that organizers send out volunteers with both local and national figures which is where the 80 percent number came from. “That specific figure was from a report that basically said that approximately 80 percent of hotel workers [who were] part of this report come across those incidents, whether physical, indecent, or any kind of aggression, so that’s the citation that we were using for our purposes,” Sanchez said. Sanchez said while only two incidents have been reported in the city, it doesn’t take away from the fact that a large number of sexual assaults go unreported, calling the Hospitality Alliance’s objection over the number a “sad attempt” at distracting from what’s important. “This initiative is about Long Beach workers, and the plight facing Long Beach workers and even though they want to throw out that only two people have reported this incident it doesn’t take away from the fact that a large number of sexual assaults go unreported,” Sanchez said. It seems the Hospitality Alliance is aware of that, too. An April 2018 hotel safety report shared with the Post notes that 63 percent of sexual assaults go unreported. The reports, which recently started and are provided to the city council, disclose the types of trainings and meetings Hospitality Alliance member hotels have conducted among other safety-related projects and campaigns. Harris said the Hospitality Alliance has been making an effort to address safety issues in hotels, with member hotels with 100 or more rooms having some type of panic button device—some having been in place for up to four years or within the last year. While Sanchez said he is glad some measures are in place, he also said the initiative is about raising standards across the entire industry, including small hotels, a desire which the city council, including Price, has previously expressed, he noted. But Harris said those standards, including the mandates proposed in the initiative, are burdensome in an industry that is already one of the most regulated not just in the state, but nationally. Harris said this initiative and the ordinance labor advocates tried to pass last fall are just “smoke and mirrors,” an attempt to unionize hotels whose employees at this time aren’t interested in unionizing. Once the city clerk’s office verifies a small portion of the signatures and files the petition, the office will then have 30 days to examine it and determine whether there are a sufficient number of valid signatures. 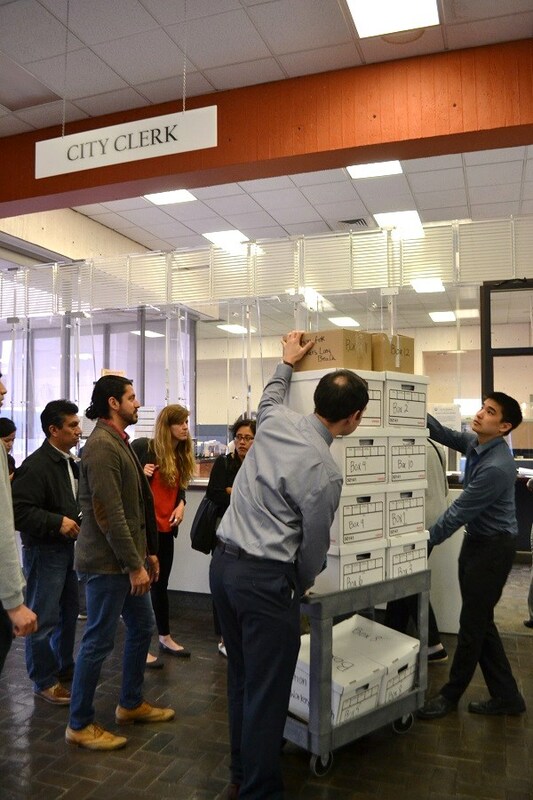 City Clerk Monique De La Garza said a raw count and examination of the signatures will first take place—a process that is estimated to take seven working days—before she determines if the city clerk’s office will conduct a random sample of about 3 percent of the total submitted signatures, or a full check of signatures. Her office will then certify the signatures and submit the petition to the city council at the next regular meeting, which is tentatively scheduled for July 17. The council will then decide to either adopt the ordinance, submit the ordinance to voters for the November 6 election, or order staff to create a report. Editor’s note: this story has been updated to reflect that the photo of the petitioner was taken by Councilwoman Suzie Price.